Apparently Karl Marx liked a game of chess. According to his biographer Francis Wheen, Marx whiled away an evening at a party hosted by the chess master Gustav Neumann as he waited for the proofs of Capital to be returned. A record remains of a game he played that night. Since everyone is undoubtedly interested in the result I can tell you that Marx won when his opponent, the enigmatic Meyer, resigned after the 28th move. Lenin too was a chess enthusiast. Despite his hectic schedule he found time to play games, via correspondence, with the likes of Anatoli Lunacarsky and Maxim Gorky. I hope that at some point an uncomprehending spy managed to intercept a letter from Vladimir only to open the envelope and find a piece of paper reading, “Bd2-c3+”. That would have kept the intelligence services busy for a while. 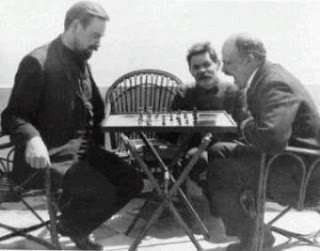 But Lenin was more than a keen player – he loved the game. His wife, Krupskaya, wrote at one point that, “Vladimir Ilyich had to give up chess, his favourite game, because it involved too much of his time.” Which is understandable when you realise that this was written about Lenin’s return to Russia in April 1917! The disappointment of her husband is almost palpable. I doubt that Lenin very often found common ground with members of the British clergy from the seventeenth century, but you suspect that he would have agreed with Thomas Fuller when he said, “When a man’s house is on fire, it’s time to break off chess.” In all honesty I’m a bit surprised that a right-wing historian hasn’t explained the July Days as a result of Lenin desperately trying to unpick Gorky’s surprise Sicilian defence. So, there you go. The two heavyweights of the Communist tradition liked nothing more than a game of chess. And could it have been otherwise when chess is nothing less than the “gymnasium of the mind”? But it raises the question of why there has been no widespread condemnation of this pastime? In my last post I noted that much of the left has berated modern sports, tripping over each other to denounce it in the sternest terms. Back in the 1920s, in post-revolutionary Russia, the Prolekult rejected sport on the grounds that it was ideologically incompatible with a socialist society, not just because of the stresses and strains it might place on the body but because its competitive nature mirrored the competition of capitalism. What then of chess? Sure it doesn’t have the athletic zeal of football, rugby or (for that matter) darts, but chess is still a competitive game. Doesn’t this make it every inch as counter-revolutionary as modern sports? In fact, if anything, in ideological terms chess is far worse than whatever modern sports has to offer. As the British grandmaster Nigel Short once remarked, “Chess is ruthless: you’ve got to be prepared to kill people.” Chess is war, nothing more, nothing less. And not even the good class-war kind of war. Two royal armies confront each other in a battle over land and supremacy. The masses are deployed in a war of position, and then sacrificed to protect the assembled clergy and aristocracy. Regicide is victory, but the result is not democracy. One ruler is replaced by another. The king is dead. Long live the king! Looked at in this way chess was counter-revolutionary in 1640 and 1789, let alone 1917. Perhaps someone, somewhere has produced a socialist version of the game where the pawns all rise up, and the players take turns capturing their own pieces in a dull – but ideologically correct – board game version of revolutionary defeatism. Yet I am still to come across somebody calling for the abolition of chess, or arguing that it is anti-socialist. Having said that, playing chess blindfolded was banned in the Soviet Union in 1930 (although this wasn’t nearly as daft as the USSR’s denunciation of yoga in 1973 because it was “based on idealistic philosophy and mysticism”! ).